In the short term valuations aren’t important to stock performance, but in the long run they provide the best information about expected returns. Stocks are one of the few assets that experience selling pressure when they go on sale. That’s because trend followers, who are focused on the short-term, are selling to avoid further losses. One great way to outperform the market is to exhibit patience in the face of panic. Utilize a long term approach when stocks are going on sale. It’s never clear whether stocks are expensive or cheap because there are metrics which conflict; changes to the fundamentals can affect whether a market is expensive or cheap. On the one hand, stocks didn’t have extremely high multiples on their expected earnings in 2007, but the unstable banking system, which was built off trading mortgage backed securities which weren’t properly priced for the losses they could incur, meant the fundamentals weren’t sound. Some investors separate the fundamentals from valuations because they claim the fundamentals are the factors that drive businesses in certain directions and valuations are multiples on the future earnings. However, value is based on if a business or economy is expected to grow, remain stable, or shrink which is why we think the fundamentals and valuations are inextricably linked. Since stocks are based on their future ability to generate profits, the forward PE multiple is important to valuing the S&P 500. Even though the stock market had a great 2017, the forward PE compressed in 2018 to the lowest since 2016 because earnings estimates have risen. As you can see from the chart below, the current forward PE is 16.4 and the dividend yield is 2.1%. The 25 year average forward PE is 16.1. 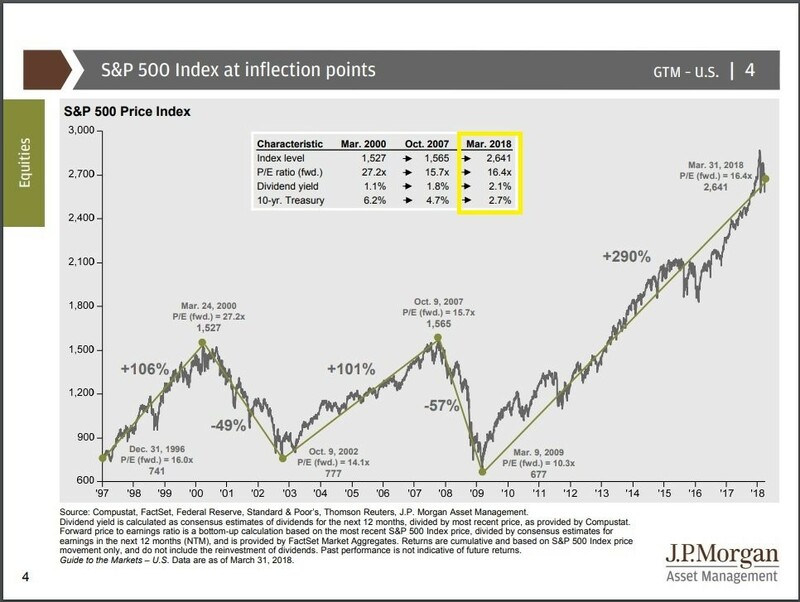 Despite increasing 290% in this bull market, the forward PE is much lower than the peak in March 2000 which was 27.2. The market is a bit more expensive than the peak in October 2007 when there was a forward PE of 15.7, but that market was brought down prematurely by the mortgage crisis. The multiple wasn’t much higher than the 14.1 that the market bottomed at in October 2002.